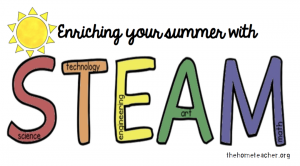 Love your summer science fun ideas. May I suggest another one to go right along with the glow-in-the dark activities? Why not have your child complete a Lunar Cycle T-shirt or apron with glow-in-the-dark phases? Here is the link to the information http://sciencewear.net/lunar-cycle.html Trust me when I say it is extremely popular. There is even a “how to” video showing step by step. https://www.youtube.com/watch?v=h9QAKTPOFzM ENJOY!